Anupam Chakraborty, Author at Ghumakkar - Inspiring travel experiences. With every sunrise, we rise. But did it ever come across your mind that while we’re still in the bed embracing the darkness of night, some other places are illuminated by the sun rays. It is witnessed in every country. Yes, in our country too. So, where does the sun rise first in India? We were climbing the steep ascent through the muddy, rocky and narrow route. Those on foot were making their path upwards according to their own convenience. Every step on such steep ascent of initial trek is the first test of one’s mind and faith. To strengthen devotees’ faith the Military Personnel are there and their presences are felt throughout the route. We entered to a zone where no mobile network was available. In the jungles, we were cut off from rest of the world. Oh, it’s not only that, we were cut off from electricity too! Yet we were so engaged with the nature that we hardly felt their absence. Into the thin air, I was struggling hard for a breath of air. I’ve not climbed above 5300m before and with only 50% oxygen in the air, was struggling even more walking across the ridge. I sat down on a boulder to rest, grasp more air and stop my heart pounding high. This morning, for the first time, oxygen saturation level in my blood dipped below 80 and the altitude began to take toll on me. But no way could I give it up. I was so close of my dream destination, Everest Base Camp! I climbed up this much and was only an hour walk away from it. “Come on Anupam, you can do it!” yelled my guide. 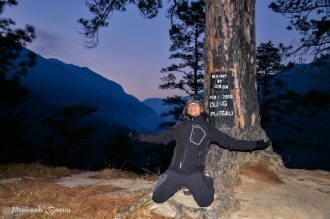 I stood up again, mumbled under my breath “Slowly Slowly, Bistar Bistar”, the Nepalese Mantra I learned from my guide for climbing high altitudes. 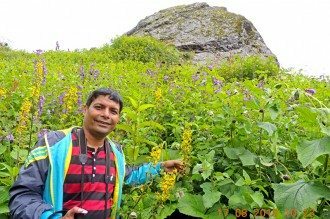 The sense of following the footsteps of many legendary Mountaineers who conquered Everest was boosting my morale and finally I reached the head of downward trail to the Base Camp. 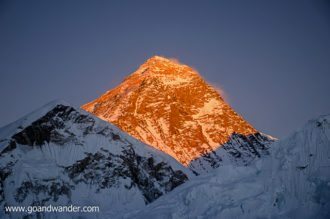 I could clearly see from there, the Base camp, Khumbu Ice fall and the Mt Everest. It was then a few minutes’ walking down to the base where rocks were piled up and covered with colourful prayer flags announcing the destination, Everest Base Camp at 5364m! Oof! The show was breath taking. While local tribes gave a good show, the visitors also enjoyed the hotness of the Raja Mircha. The Israeli girl put a brave face though her chicks grew red in every second that made her look more beautiful. Anyways, she could successfully eat two King Chilies. 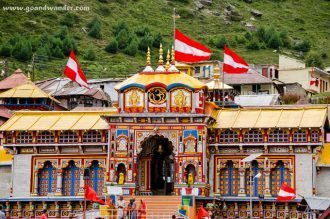 Holy Badrinath Temple, one of the Char (four) Dham (pilgrimage centre) in India, is the temple of Lord Vishnu in Uttarakhand. Nestled in the lap of Himalayan mountain ranges, this colourful temple stands with the river Alakananda flowing on its front and the magnificent peak Neelkantha, also known as ‘Garhwal Queen’ on its back. Just imagine, there you are, at one of the most popular pilgrimage sites in India, the Badrinath Temple! Truly it would have been impossible for us, to take a step without crushing a flower, had there been no stone paves deep into the Valley of Flowers. We walked deep into the valley; saw many flowers of different colours, pink, blue, red, white, yellow and many others. Every single flower, though tiny, is so beautiful and colourful that none gets less attention from the visitors. These flowers are all wild. They vary in shape and colour at different altitudes. The flowers in the valley keep changing in different phases of monsoon. So after every 10-15 days of interval, a new set of flowers replace the old flowers and the Valley gets a new look every time such changes are happened. But do not expect to see any big flower in the valley as they do not reside here. No human soul lives around the valley though it is not soulless completely! The valley remained unknown to the world until 1931, when arrived there like Alice in Wonderland, six British Mountaineers, who lost their way while returning from a successful expedition to Mt Kamet. 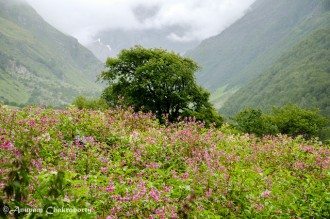 Numerous wild flowers cover the Valley in monsoon and create a magical sight of a wonderland. Frank S. Smythe, one of the six British mountaineers, while mentioning about the Valley wrote, “it was impossible to take a step without crushing a flower”. They named it the Valley of Flower and thereafter the valley has become a popular place for summer expedition. The show began! 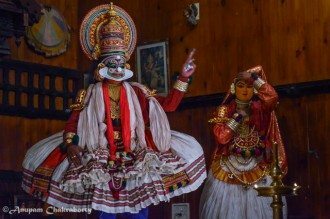 At the beginning, various movements of the body, face, hands, legs etc were demonstrated to give the audience an idea of how the things are expressed in Kathakali. It was an interesting initial part of the actual play. The main play followed shortly after this. 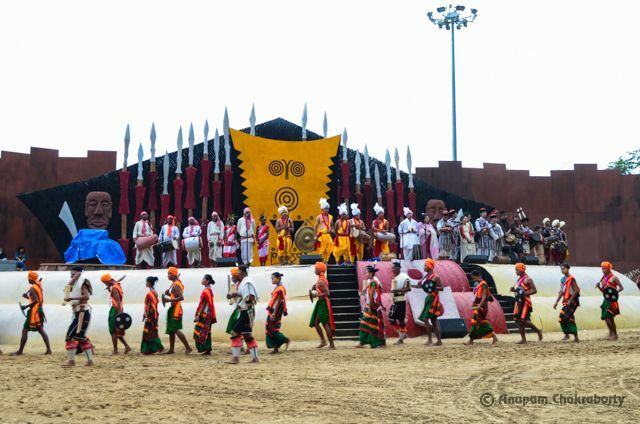 It was a play from the epic Mahabharata, named Kichakavadam, the killing of Kichaka. The evil character, Kichaka, an-anti hero, was in the make-up of face, half green and half red. He was the commander-in-chief of the Army of the kingdom Matsya ruled by King Virata. Kichaka was the brother-in-law of King Virata. During their one year hide out, Pancha Pandava (five Pandava princes) and their wife Draupadi took shelter in the palace of King Virata. While Draupadi was disguised as Dasi (female servant of the Queen) calling herself Sairandhri………. 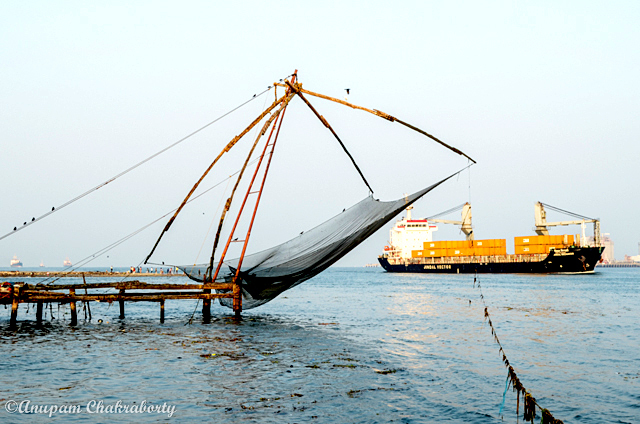 Almost every tourist attractions in Fort Kochi have a history of their own so is the Chinese fishing net. Kochi, the ‘Queen of Arabian Sea’, was once a major centre of trade with the Arabs, Chinese, Portuguese, Dutch and the British where everyone had left their marks. 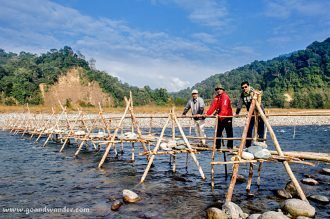 While some claim that the Chinese traders from the court of Kublai Khan set up Chinese fishing nets to shores of Kochi that dates back to 14th century; some others say Chinese explorer Zhang He introduced the Chinese fishing nets here in early 15th century. Whatever may be the correct claim, the fact is that this system is in use for more than last 500 years. 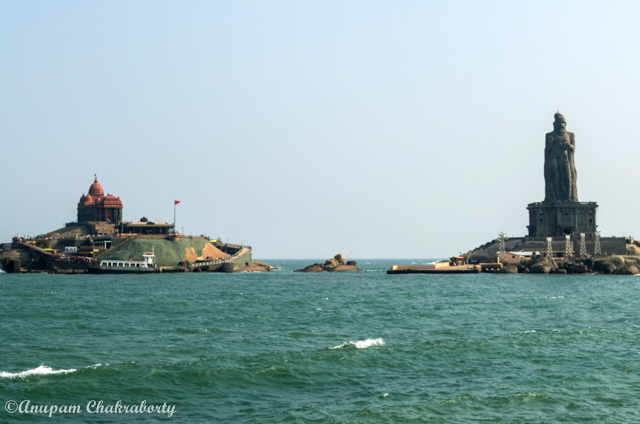 Once a fishing accessory, the Chinese fishing nets, now have become a major tourist attraction in Fort Kochi. 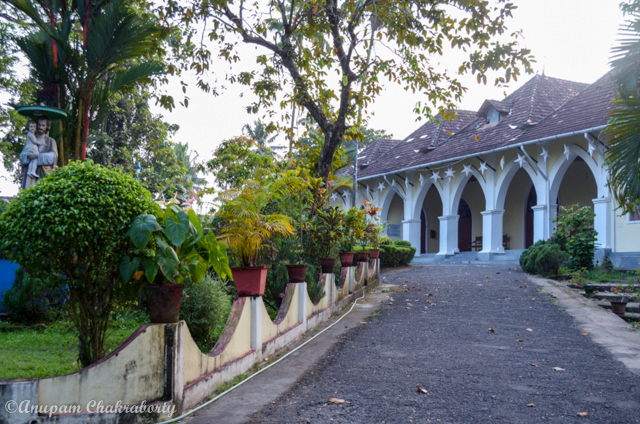 No cannon or other displays that go along with a Fort do exist at Fort Kochi. Though there are narrow alleys but none led to any gallery or a palace of any king or queen that a fort guards. In fact there exists no fort though the name endures it. Fort Kochi is a place within the city of Kochi and lies in the peninsula. Perhaps the name takes its first part since a fort was built in this region by the Portuguese. A memorial to Swamy Vivekananda stands on a rock surrounded by sea at Kanyakumari where he was presumably meditated on 25, 26 and 27th December 1892 before leaving for Chicago religious conference. It is the point of convergence of the three seas, the Arabian Sea, Bay of Bengal and the great Indian Ocean. Swamy Vivekananda, the great disciple of Sri Ramakrishna Paramahamsa (the best known saint of India during 19th century) and the founder of Ramakrishna Mission, on his quest to know the purpose of life, wandered all over India after the death of Sri Paramahamsa Dev. He came to Kanyakumari on 24.12.1892 and later, participated in the World Religious Conference at Chicago on 11th September 1893.